If you’re looking for a fun team-oriented way to stay active this Fall, then you’ll be excited to hear California Family Fitness Rocklin Sports Complex is offering seasonal team training opportunities. 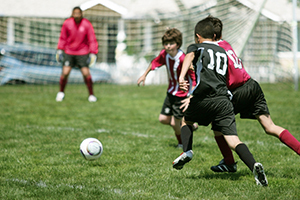 Move your kicks and hoops into high gear with Youth Soccer, Futsal, or Basketball Training. Our Youth Soccer & Futsal focuses on building technique and sportsmanship with youth in a team environment. Online team registration opens Saturday, October 12th at 7am. We offer leagues for both boys and girls U8-U16. We will also be accepting ONLINE "free agent" registrations from individuals looking to join a team. We are proud to announce that California Family Fitness and Follow Through athletics are now offering basketball skills training! Take your game to the next level with sport specific training through one on one training, or in a group setting, with an experienced trainer with these training clinics & sessions. Drills will focusing on improving both defensive and offensive skills.